Contact Anna Karas at Arctic Breed Rescue Inc to express your interest. Another successful adoption - amazing work Arctic Breed Rescue Inc! 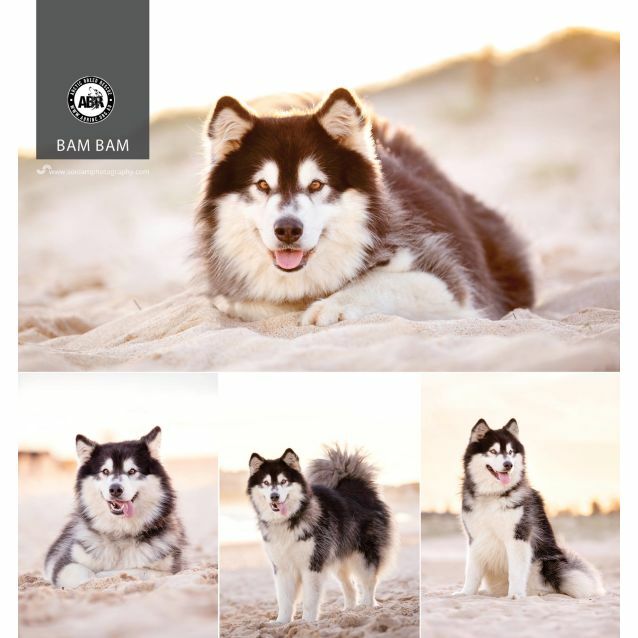 More successful adoptions - amazing work Arctic Breed Rescue Inc! I've been described as adorably boofy. A happy floof, if you will. Not much phases me and riding shotgun as we adventure may as well become my middle name. I'll even throw in the added bonus of being exceptional on lead - so having me with you will not be seen as a chore but a delight. Enter my orbit and strangers become mere pawns to my charming and affectionate self. And if, by some strange aligning of the planets, that does not eventuate I am not averse to using my big paws to demand said affection. And you will give it, for why do you think they named me Bam Bam? Aside from being human there are few things you can do to guarantee you become the centre of my world. These consist of belleh rubs, access to my newfound love of all things beach, and chicken jerky. But not chicken itself, just the jerky thanks. My loving nature extends towards most all four pawed canine friends of all sizes, complete with all levels of flirt. But please, refrain from barking in my face and challenging me as a means of making my acquaintance. I may be chilled, mellow and playful but one gaze into my golden browns will confirm that i am malamute, after all. My final shock of the day? If you are experienced with feline/arctic interactions, with said feline being of the persuasion who is not adverse to spirited play and the odd bopping on the nose to remind me of my place in the scheme of things, we may be able to make it work. Includes desexing, current C5 vaccination, microchip, parasite treatment and NSW Lifetime Registration. Once we have received your application one of our coordinators will be in touch to discuss further.